It’s still a surprise how easy it’s become to eat locally. A quick glance at my bowl and I realize that, aside from the wine and black pepper, everything’s from either the garden or one of our local food producers — fresh haddock from the North Berwick Farmers’ Market, jowl bacon from New Roots Farm, milk from Harris Farm, and the rest from our own garden. What first attracted me to this recipe for fish chowder is the unusual way it’s put together. It harkens back to how chowders were originally cooked, with ingredients piled on top of one another in separate layers, and baked slowly over a fire. It’s perfect for now, when the evenings turn cold, and is easily adapted to what’s in season. Here, I’ve swapped fennel for the onion and, as a counterpoint, the last of the summer squash, simply sauteed, is served alongside. In keeping with the subtle flavor of the fennel, I used the less smoky jowl bacon, or guanciale. As we move deeper into the season, leeks and Brussels sprouts are sure to make an appearance the next time we have this. – Cook the bacon in a large (6 quart) Dutch oven or heavy flameproof casserole over medium heat until crisp and the fat is rendered, about 10 minutes. Remove the bacon bits, and drain on paper towels. Add the fennel to the pan drippings and cook until the vegetables begin to soften, about 4 minutes. – Layer the potatoes over the fennel mixture and sprinkle with the salt, pepper, and thyme. Pour in the fish stock, milk, and wine and add the bay leaf. – Cover and bake for 35 to 40 minutes, until potatoes are tender. Arrange the fish over the potatoes, gently pushing down into the cooking liquid. Bake, uncovered, until the fish is just cooked through and the potatoes are very tender, 10 to 20 minutes. Discard bay leaf. Adjust seasoning if necessary. Finish by topping with a couple of pats of butter, letting it melt into a broken slick on top. Adapted from “The New England Cookbook” by Brooke Dojny. 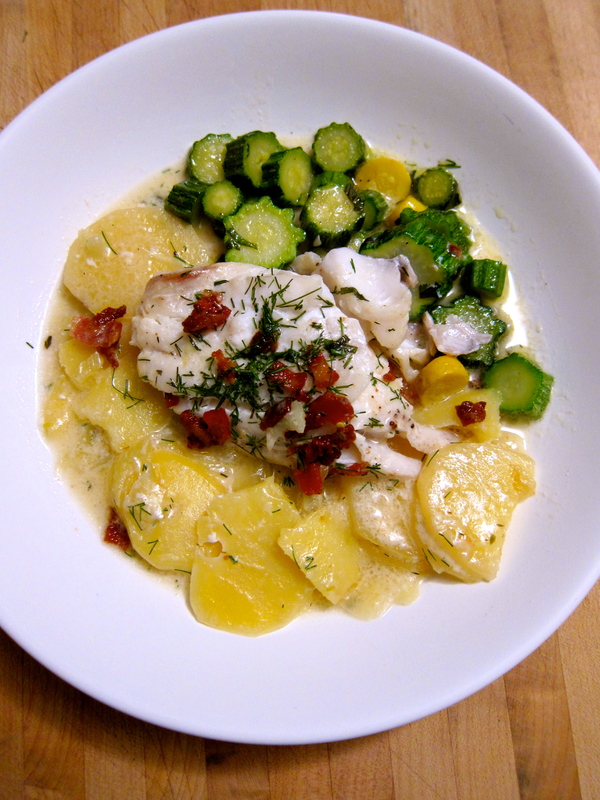 This entry was posted in cooking and tagged bacon, fennel, potatoes, seafood, summer squash. Bookmark the permalink. We loved NR’s jowl bacon! Talk about flavor and crisp…I used it for the butternut, chestnut & bacon risotto that I’ve posted on. Your mention of chowder cooking in days of yore immediately brought to mind the “stone soup” parties that friends of ours have in late fall. Big cauldron set up over an oak campfire…everyone who attends brings an ingredient, each put into the pot based on cooking time…so good, so delicious, so energizing. ‘Course, the cauldron steals the show…. Hey birdgirl, you found me out! Hope you have a great Thanksgiving feasting on all of our amazing local bounty!